Most natural disaster preparation guides recommend setting aside 1 gallon of clean water per person per day to last a minimum of 3 days. Given most of us probably have enough back fat to withstand a sustained food outage, water is the vital resource we humans or furry pets could not do without. But is setting aside emergency water an absolute necessity of disaster preparation or is it yet another task authorities recommend that gives people the illusion of being prepared? Back in the late seventies, the city of Seoul suffered periodic municipal water outages which were announced in advance in the newspapers. My mom being a super planner would save more than we needed filling our bathtub and every available container in the house. On one of the outage days, the owner of the neighborhood Chinese restaurant came to our house frantically begging for as much water as my Mom could spare as his cook had forgotten to save any water. As my mother was the only one on the block with surplus water, she was able to save an entire Chinese wedding banquet. Though my mother's gesture remained anonymous to the bride and groom, our family enjoyed deluxe service and freebies whenever we ate at the restaurant. With this kind of family precedence, I also have been diligently saving drinking water in case I may have to help out our corner Chinese restaurant although our county Health Inspection Department probably would not approve of such food service use. In California, we are preparing for the "Big One" so I chose steel water bottles for in house storage to replace plastic jugs which could easily get crushed and leak during an earthquake. We use the smaller water bottles on a daily basis and the larger containers for camping and traveling. 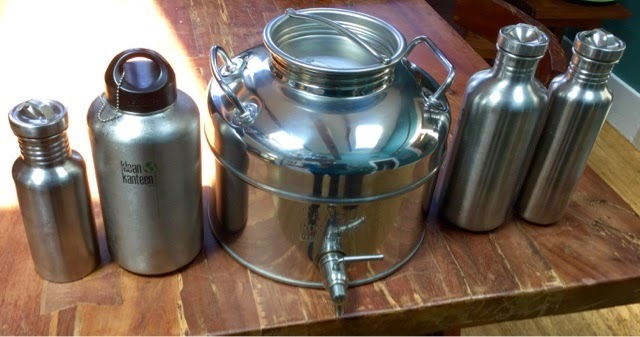 Kleen Canteen stainless steel water bottles from left to right (12oz, 64oz, 40oz, 18oz). These hold filtered drinking water. To keep the water constantly rotated, I use this water for making tea and refill the the containers on a daily basis. This 10 Litre Italian Sansone Fusti in the middle is overkill but I spotted it for $80 at Marshalls and could not resist the temptation of providing emergency water in such style. I store chlorinated tap water so I can rotate water every few months. For the bulk of our emergency water, I have a blue plastic 7 Gallon Reliance Aqua Tainer from REI which we store in the shed. In more than fifteen years of California living, I experienced only two water emergencies. The sewage gods decided to break our plumbing on New Year's day a few years ago; water flowed out but could not go down. We were lucky enough to have a neighbor give us house keys for ready access to her bathroom. During our second emergency, our water utility EBMUD had turned off our block's water for maintenance, so I actually had to use our stored water to wash my face and get ready for work. I remember being kind of excited that saving water came to some use. The lazy girl in me thinks if I did nothing about this water business- would it matter at all? It's a lot of effort keeping 10 gallons of water constantly rotated. I live in an urban corridor two blocks from a Walgreens, Whole Foods, Dollar Store and two gas stations. I could probably buy water at $5-10 a gallon if I needed to if the stores haven't been completely looted out. However the real water emergency we face now is of a different nature than what I've actually prepared for. Due to the California drought, EBMUD will be switching to warmer acrid tasting water this Sunday potentially until the rains come. This is such a long time to wait that I have to hope our water filter is good enough. My apologies if I'm going about this in the wrong way, I'm new to blogspot. I just began a new company called NovelTeas based in Berkeley (like you?) and we are making novel-inspired tea blends (www.novelteatins.com). Illustrated by hand, each of our tins are filled with more than 40 cups of organic tea in flavors paired to the theme and title of classic books. For example, the Man of La ManChai, Don Quixotea, pours his companion a cup of tea on the tin book's cover. Inside the tin the Don abides an adventurous Spanish blend of rich cardamon, red cinnamon, black tea and the root of ginger. While we'd love your support for our upcoming KickStarter on Thursday. We are also very interested in meeting you and talking tea sometime in Berkeley. While we'd love your support for our upcoming KickStarter on Thursday, we are also very interested in meeting you and talking tea sometime in Berkeley.